Pygmy seahorses are well known to the SCUBA diving community, however very little is known about the biology of these tiny fish. I have spent the past four years observing and recording the intimate social interactions of Denise’s pygmy seahorses (Hippocampus denise) as part of my PhD studies. I have been lucky enough to be one of the few people (or maybe even the only person) to see fighting, mating and even birth on such a miniature scale. Through my research I have found that these diminutive seahorses do not live up to the strict standards of monogamy set by their larger cousins. 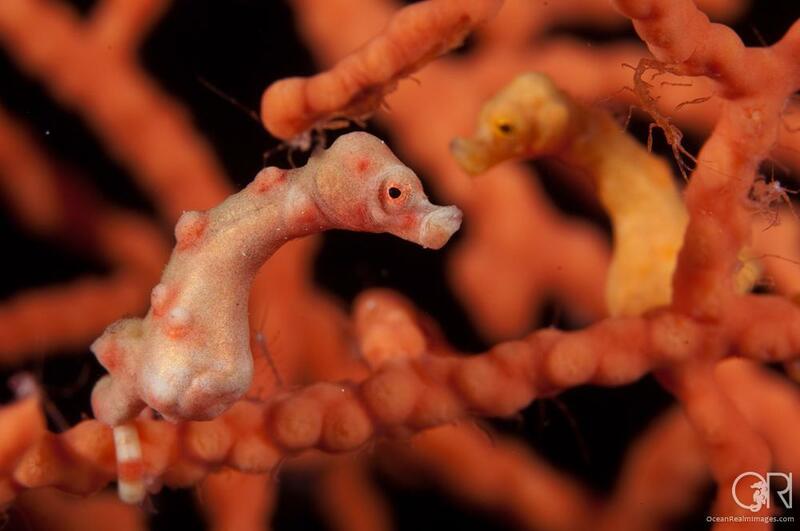 Two of the seven species of pygmy seahorse spend their entire adult lives on a single gorgonian coral. This specific habitat requirement, small populations and adoration from SCUBA divers put them at risk. Sadly, without great care it is easy to damage these delicate fish. However, my research has highlighted certain diver behaviours that can easily be avoided when observing pygmies. Despite reaching less than 2.5 cm in length, pygmy seahorses have proven to be a fascinating and rewarding study subject. However, this first study of their biology has raised as many questions as it has answered.